My favourite campaign of the year by far and it's only January. 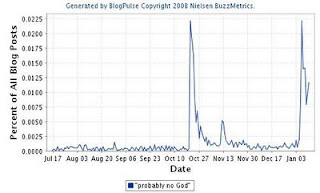 "There's probably no God, now stop worrying and enjoy your life"
In fact, this Nielsen BlogPulse run for the term 'probably no God' shows that even suggesting they would spend the money generated as much hype online as actually spending it. "The ASA has received 141 complaints about the Atheist Bus Campaign which launched earlier this week on buses throughout England, Scotland and Wales, as well as the London underground. However, 39 of the complaints are regarding newspaper and online articles about the campaign, which the ASA has no power to deal with."